Routine changes are rarely routine. Shortly after we adopted Lily, we realized she could jump our 4’ fence. From a sitting position. So we decided to replace our 4’ fence with one that’s 6’ instead. No big deal, right? It’s just a fence. At 14, Chico needs to go out frequently, so we have a dog door that opens to the backyard. So the day of the install I worked from home to ensure we didn’t have accidents in the house. That was the plan at least. 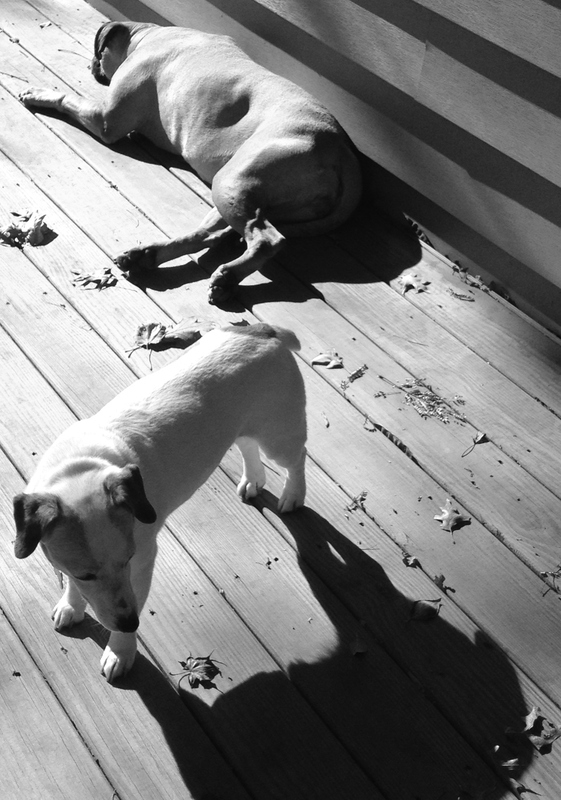 All day long the dogs whined and paced at the back door. I’d walk them, but as soon as we got in, they were at the back door again wanting to go out. We went for our third walk of the day around 3pm. I took the dogs into the house, and I went back to get the mail. Three minutes later I walked into the house – and someone had pooped on the kitchen floor. Seriously? THEY WERE JUST OUTSIDE. What was going on with them? Like kids, dogs thrive on routine. And what seemed like a small change in routine to us had completely thrown the dogs for a loop. This week my work world was rocked. Hard. And while the change could certainly be defined as “routine” – in that it happens every day in the world of work – it felt earth-shattering to me. And I’ve been doing my own human version of whining and pacing at the back door. Fear. Worry. Anxiety. Fretting. Those have been my companions this week. But unlike my dogs, I don’t have an excuse for fixating on my circumstances. We are told to “be anxious for nothing”, and I need to start living out that command. Each day I am being confronted with situations, big and small, that require me to trust that God has my back. Each day I am being taught that, while we never know when life will throw us an unwanted change, I can choose how I respond. Instead of pacing and whining, I can pray and trust. There’s a battle going on in our house these days, and it’s all about food. When Chico joined our family nearly three years ago, he was known for being a chow hound. He had eaten pies, jars of peanut butter, and just about anything he could swipe off a kitchen counter. He even learned how to pop the tops off cat food cans to get the tasty contents. So we got used to keeping the counters clear of food. But old age and bad hips have ended his food burglary days. So we were vexed when we came home two weeks ago to an empty bread bag on the living room floor. If it wasn’t Chico, and it clearly wasn’t Coco (pictured to the right), then that left our lovely Lily as the culprit. It’s been clear from the start that Lily loves food. We don’t know her full history, but we do know she was heartworm positive and underweight when she and her pups were abandoned at a shelter. So she likely wasn’t fed regularly. That said, it’s no surprise that she gets excited about food. Although she doesn’t beg, she will sit nearby while we’re eating. Just staring and drooling. A lot. It’s like a faucet is running out of her mouth onto the floor. But until last week, that was the beginning and end to her obsession. So we’ve started putting the food away again. No big deal. But this week we came home to David’s antibiotic pack, which he had left on the counter, on the floor. One large white pill had been removed and left on the floor (mostly intact) with the rest of the packet. Clearly she got one taste and spit it out – thank goodness. She hasn’t lost weight, so we know she’s getting enough food. But clearly she wants more. And apparently she’s willing to take some risks to get it. Yesterday morning she decided she would try to steal Chico’s food from him – while he was still eating it. Chico may be old, but he’s no easy win. And he wasn’t going to give up his food without a fight. So we had a dog tussle before I’d even had time to get a cup of coffee. Frustrated, I pulled them apart and scolded Lily while I let Chico finish his breakfast. As I was asking her why she was looking for more food when she already had her breakfast (I’m not the only one who talks to my dogs, am I?) – I was struck by the fact that I could ask myself the same question. Dang. I hate when that happens. Because the truth is, I am obsessed with food. I spend an incalculable amount of time thinking about food. What I have eaten. What I haven’t eaten. What I want to eat but shouldn’t. What I shouldn’t have eaten but did. And that’s my dirty little secret. I have lost and gained the same 15 pounds over the past 15 years. And it’s all because of my food obsession. Not because I need to lose 15 pounds. Or even because it’s not healthy. But rather because food has become an idol for me. And that’s not how I’m supposed to live. So although I’m not sure how this is going to play out, I’m committing to myself and God that I’m going to kick this once and for all. It’s not going to be easy, but I know that God will help me if I let Him. In the meantime, I’m going to cut Lily some slack and trust that we’ll get through this one together. We used to joke that there’s no better barometer than a bulldog. I’ve had three, and all of them were terrified of thunder. So any change in barometric pressure set off a series of behaviors peculiar to each one. My favorite was Petunia. 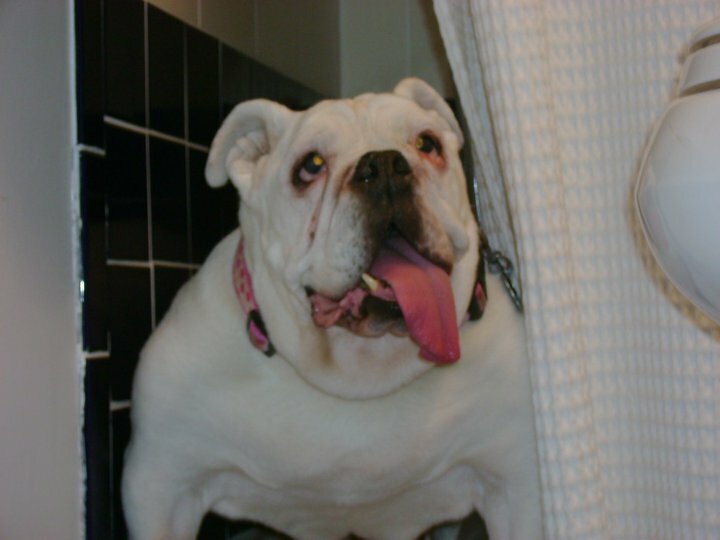 As the photo above shows, you could guarantee there’d be a storm within a few hours if you found Petunia in the shower. She’d seek refuge there well before there was a physical sign of impending weather. It could be sunny and cloudless, but somehow she knew. And in my 6+ years of living with her, she was never wrong. Dogs are funny that way. They can often sense coming storms even when we don’t. And not just weather storms. One night this week I was walking Lily and she was just off the charts naughty. We’ve been working with her diligently on her leash skills, so I was taken aback by the sudden change in her behavior. She was darting back and forth across my path. She barked at two young kids walking by and all three dogs we passed. She was leaning so hard into her leash she nearly pulled me over. I had a storm brewing inside my spirit, and Lily clearly was picking up on it. It had been one of those weeks. Work was crazy busy and I was worried and pre-occupied with some meetings that were coming up. David was sick and I was concerned about his continued cough. I wasn’t sleeping well so I skipped a couple of my morning workouts and quiet time because I had tried to catch up on my missed sleep. All of which in turn drove me to more coffee and sugar to try and assuage my growing fatigue. All that created a perfect storm within me, and I was missing my peace and my joy. I needed to exchange my coffee and a donut for the only food that can calm the waves within my soul – God’s Word. The next morning I got up, worked out, showered, and got comfortable with my Bible and my journal. And I wondered to myself how it was possible that I could so quickly forget my priorities. Food, sleep, fretting – none of that brings the peace that I long for each day. Only some quiet time with the Word can calm the storm within my soul. And it did. It should be no surprise that Lily was good as gold that night when we went for our evening walk. Now I just need to get another bulldog to help me predict those weather storms that keep coming our way. Recently, a good friend of mine went with me to visit two sweet women living in a nursing home. They’re a mother-daughter pair, and they went to my church for many, many years. Both suffer from memory problems, but they love talking about our mutual friends and memories from their time at Southview. There’s something so bittersweet about these visits. I feel torn between the joy of visiting with such lovely ladies and the sadness of recognizing the loss that comes with age. While they have varying degrees of memory issues, they both recognize that they are no longer living at home, and both express a desire to return to that home. The daughter noted how much she missed simple things like cutting the grass and walking in the mall. At that moment, I realized how much I take for granted each day. And how easily I can breeze through days without pausing to be thankful for all I can do. When I arrived home, it was dinner time for the puppies. Our dogs are 14, 10 and 2ish, so the only one who takes our usual 2-mile post-dinner walk is our youngest, Lily. The other two simply aren’t interested anymore. But this night, Chico followed me to the door and starting nudging my leg with his snout, his sign that he wants to go out. But two miles is too far for an old dog with bad hips. So I started getting Lily’s leash on and told Chico he’d need to stay home. But he nudged me again, and I felt the Spirit remind me of my earlier visit to the nursing home. Those ladies longed for the simple pleasure of being outside and moving freely. I was reminded that something as simple as a walk could be a real blessing to someone who can no longer enjoy all the things we take for granted each day. I looked at Chico’s sweet brown face and told him he was going for a walk. I grabbed his leash and his tail was wagging so hard it was pulling his whole hind end with it. He danced around and pushed his way through the door as soon as it was cracked open. We took a shorter walk that night. We moseyed along and Lily matched her pace to Chico’s. The air was brisk and the stars were out. It was a beautiful night and we took our time walking through the quiet neighborhood. The dogs walked side by side, tails wagging nearly in unison. And I felt a joy that only comes when I slow down and recognize the multitude of blessings I all too often take for granted. …a husband, son and family who love me. …good health and the ability to walk, run and dance anytime I like. …a warm house, clean water, food and a comfortable bed. …a church family that cares about its members even when they’re not able to make it to the physical church building anymore. …a God who loves me even when I take all these blessings for granted. We had a great walk. And I might be crazy, but I’m pretty sure I saw a satisfied look on old Chico’s face when we got back home. I kissed that sweet face and thanked him for reminding me to appreciate the simple things. 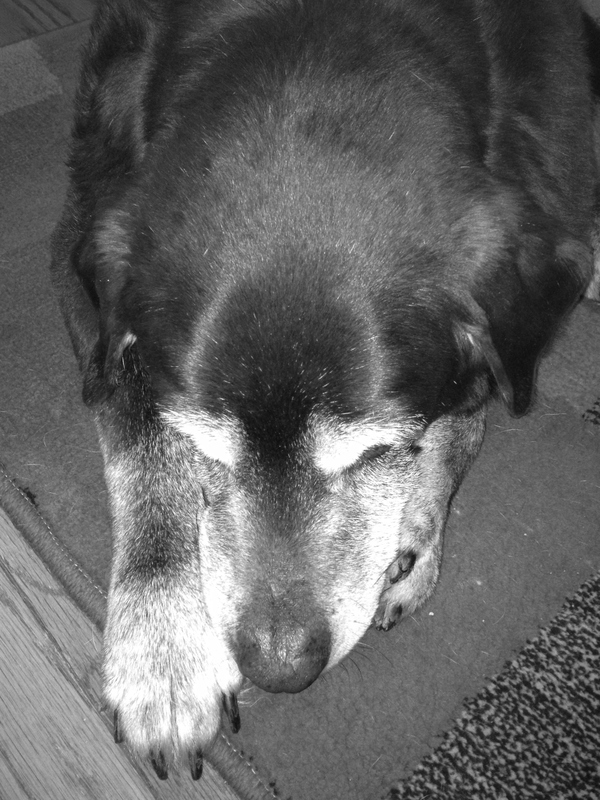 Our chocolate lab, Chico, is 14 ½ years old. That’s about 100 in people years. It should be no surprise then, that he’s pretty mellow. He loves eating, and these days that warrants a slightly more vigorous than average tail wagging, but that’s about it. 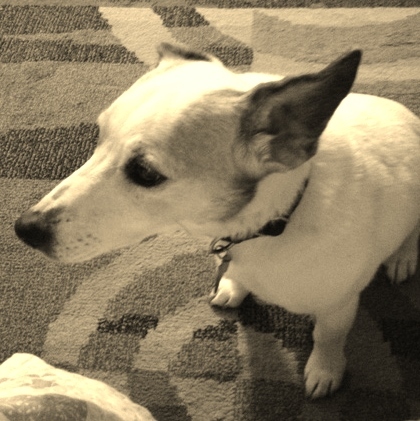 He almost never barks and his days of grabbing pies off the kitchen counter are long gone. So I was shocked when I came home to find this normally placid couch potato of ours barking like a lunatic and banging his snout against the front window like he was trying to escape a house fire. What had inspired this kind of crazed reaction? Solicitors. Two guys hawking home improvement services thought it would be cute to wear funny Viking hats (braids and all) while trying to convince cold-weary homeowners that they needed to prep for spring by getting new siding and a deck. I wasn’t buying it, and clearly neither was Chico. What surprised me was that Chico had shown me a face I’d never seen before. He’s normally a sweet, loving, and funny boy. A clown not a bully. It made me wonder what other faces he had hidden that I’d never seen. Several people have asked why I decided to write this blog. One reason is that Chico’s not the only one with multiple faces. I’ve got two that rarely cross paths: my church face and my worldly face. One is kind and patient and joyful. The other is frank and funny and occasionally mean-spirited. One turns the other cheek. The other curses when she’s mad. But neither one is entirely honest. By limiting the people with whom I’m willing to be completely myself, I’m shortchanging them and me. Jesus doesn’t ask us to change before He loves us. He just says follow me. And I do. But, like all Jesus followers, I’m a work in progress. And I will be as long as I’m breathing. So I’m going to stop showing the face I think people want to see and start showing the one true face I have – the imperfect one. And this blog is my first step. My car dashboard read 21 degrees when I pulled into the driveway, so I knew getting Lily to go for a walk was going to be a challenge. She’s a bull mastiff mix from Mississippi and she does not like cold weather. We bought her a coat, but even that hasn’t helped. When I grabbed Lily’s coat off the hook to put it on her, she darted past me and ran upstairs to our bedroom. She was curled up on her bed, looking like she was trying to make herself as small as possible. Probably in hopes that I would not make her go out for her after-dinner walk. I bent down and she darted off again, this time to the family room. I found her under the sofa table. I called her to come out and she ignored me. I called her again. And a third time. Finally, on the fourth try she came out, head down almost to the floor, clearly ashamed for ignoring my commands. Lily’s delayed obedience struck a raw nerve with me. In a recent sermon our pastor spoke about the fact that delayed obedience = disobedience. And I have been just as guilty of it as Lily. I love Jesus, and He often has to get creative in His attempts to reach me and teach me because I can be both disobedient and obstinate. (Insert appropriate shocked responses here – or not.) And he often uses my dogs to point out things about me that He wants me to change. 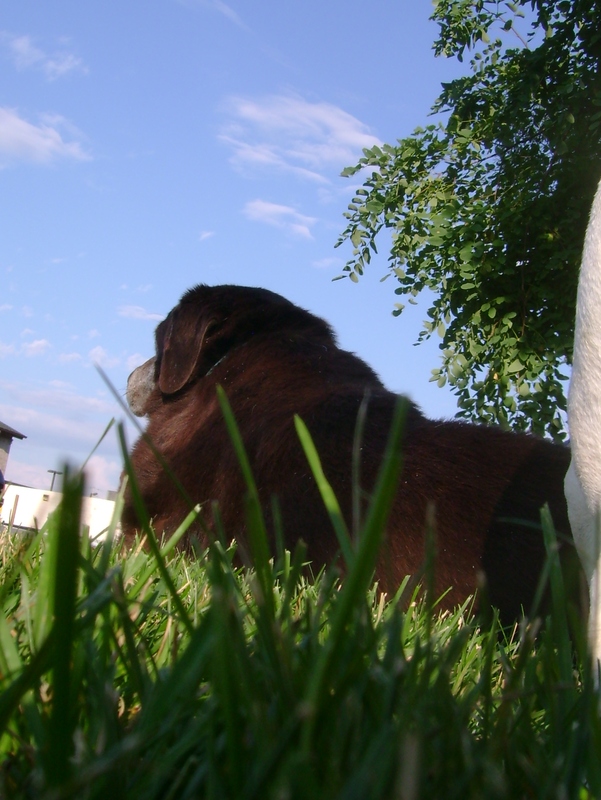 Several months ago I felt a prompting to share some of the lessons God’s taught me about my own faith through our dogs. But, until now, I haven’t done it. Why? Mostly because I didn’t think anyone would be interested in reading about it. And, if I’m honest, I just didn’t feel like it. It’s work I just didn’t feel like doing. But if I’ve learned anything over my years of following Jesus, it’s that He’s persistent. Really persistent. Some might even say pushy. Until eventually, it’s more work to resist than it is to just do whatever it is I’m being directed to. I love Jesus and I love dogs. A lot. And this is my record of how Jesus has used a whole slew of shelter dogs (and a couple of spoiled rotten purebred puppies) to teach me about love, life and the path to redemption. If you enjoy what you read, please share it with your friends. If you don’t, leave me a comment and tell me why.